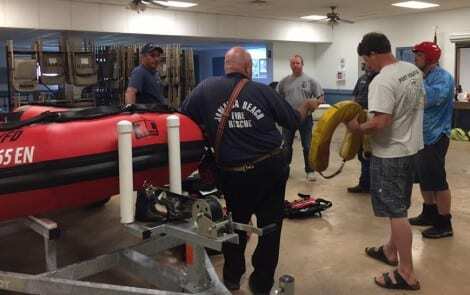 On Saturday, March 30th, members of Port Bolivar VFD conducted initial training of the Rescue boat purchased by Emergency Services District #2. The class consisted of observing water conditions, equipment needed to perform rescues, accessing victims in the water and boater safety. There where 15 people present from Port Bolivar VFD, Galveston County ESD#2, and Medic 21 crew stationed at PBVFD. The class was conducted by the Fire Chief Kyle Baden, Jamaica Beach VFD.